Good. 0307390683 USED US EDITION BOOK-Items do not contain any supplemental materials even if listed in the title. Books have stickers, highlighting, writing, or tape used to mask instruct edition. Pages and Cover may have creases, scratches, or slight water damage. Consumable items are filled out and completed. We ship out most orders within 1 business day with tracking. Very Good. 0307390683 Minor shelf wear. Most biographers of the Founders make reference to Mount Vernon or Monticello but concentrate on the man and the times. Here however the emphasis is on the gardens brought forth by men more esteemed for their political background. 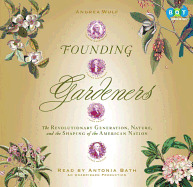 Students of history will find it refreshing while gardeners will be enchanted. I have sent 2 copies to family members, who are gardeners and history fans, with rave reports. I managed to read the first one before mailing, didn't finish, so may have to order one for myself so I can finish. So interesting to see that history repeats itself over and over.